Vinayaka's Kitchen: Ragi Chapathi - Indian Ragi Flatbread - How-to? 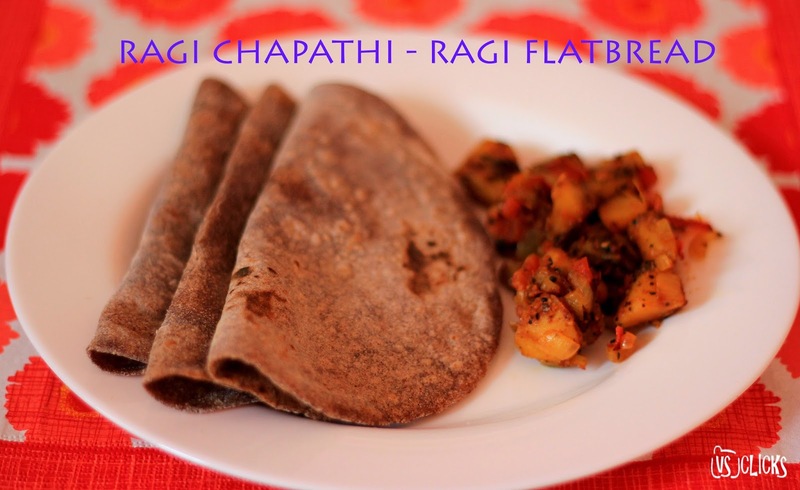 Ragi Chapathi - Indian Ragi Flatbread - How-to? 1. Take a wide bowl. Add 1 cup of wheat flour, 3/4 cup of ragi flour, 3 tbsp of curd and salt to taste. Add 220 ml of water and stir until it is fully combined. Once the dough is ready, spray 1tsp of oil on all sides, and leave it untouched for 1 hour. 2. Check if the dough is ready or not. If ready divide the dough into small balls. Take one dough at a time. Press the dough with fingers first and sprinkle wheat flour on it. Roll the dough with a rolling pin until it becomes thin and flat. In case if the dough sticks to the rolling pin, sprinkle a little amount of wheat flour on it. 3. Heat the pan well. Cook the chapathi on both sides until it blisters on its surface. 4. Leave until it becomes fluffy (as in video). Remove the chapathi and serve it with a gravy/curry/side dish of your choice. #1: Adding oil keeps the dough soft and non-sticky. #2: Leaving the dough untouched for one hour makes the ragi chapathi soft and easy to tear while eating. #3: Adding curd keeps the dough extra softness and helps in fermentation process. #DoYouKnow: The word 'Chapati' means "flattened round" in Indian languages. Ragi Chapati is a healthy recipe, easy to cook, and attracts kids easily. Ragi Chapathi (also known as Indian Ragi flatbread) is a common staple of cuisine in South Asia as well as amongst South Asian expatriates throughout the world and this goes well with all types of Indian spicy gravies. 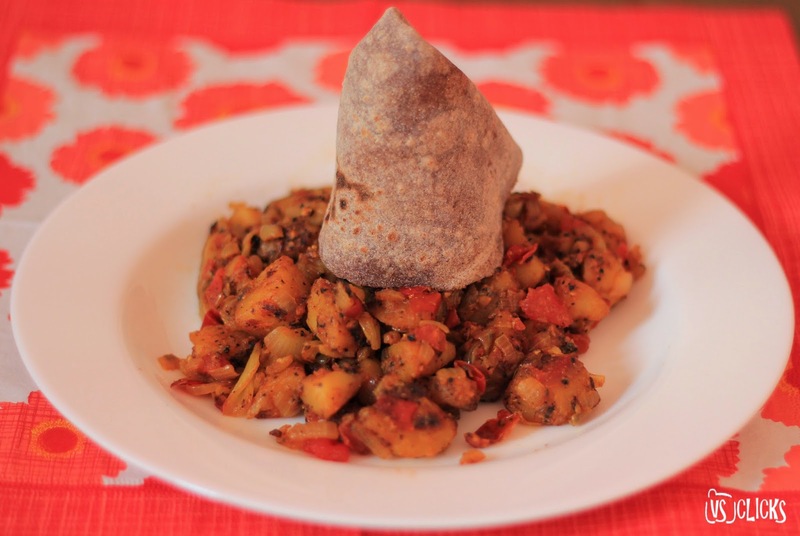 Ragi Chapathi with poatato fry made our lunch divine. Try it out and you are welcome to post the pics here.